Available from Saturday, 15 September, 2001 at 10:00 am. New National Theatre, Tokyo presents the best play, which won the London Evening Standard Theatre Award in 1998, Tony Award in 2000, and other awards. The scene is in Copenhagen under the Nazi occupation of 1941. The German physicist, Werner Heisenberg made a special trip to the city to see Niels Bohr, a Jewish-Danish physicist and also his former teacher. Although Heisenberg was involved in the Nazis' secret plans, he called on the Bohr who had connections with the Americans. Having been closely bound in the past, like father and son, and having worked together to research and establish quantum mechanics in the 1920s, the two had a strong teacher and student relationship. What was the true motive behind Heisenberg's visit? What did the two talk about? Was Heisenberg's purpose to investigate the American moves to create the atomic bomb? Was it to report the progress made by the Germans? Or was it to propose a halt producing the atomic bomb? Or did he, perhaps, have other reasons for visiting? 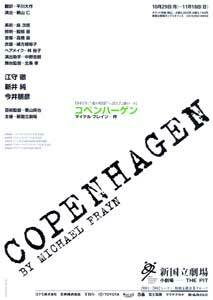 Copenhagen, written by the prestigious British playwright Michael Frayn, focuses on an historical episode that is still wrapped in a veil of mystery and attempts to draw various inferences from the episode. In putting atomic energy to practical use, Bohr and Heisenberg reiterate conflicts and understanding each other while vacillating between intellectual curiosity and ethics. Joined by Margrethe, Bohr's wife, who calmly observes the two, the play is staged as a human drama with full of tension. Its productions in London and Broadway have been admired as extraordinary creative stage direction, including the several layered structure of plot and sub-plot, thrilling conversations that stimulated the intellectual imagination, and contrivances into which theories of quantum mechanics were incorporated like pieces of a puzzle. Leading staff and cast come up to Japanese premiere of Copenhagen at the NNTT. The play is directed by Hitoshi Uyama, who has a reputation for his delicate and unconventional stage direction. The cast includes Toru Emori, as Bohr, who has an overwhelming dignity; Jun Arai, as Margrethe, who is the charismatic leading actress of the theatrical company Kuro Tento (Black Tent); and Tomohiko Imai, as Heisenberg, who is one of today's most talented young actors. Look forward to Copenhagen, an intellectual suspense drama, making a highlight of the NNTT's autumn season. * The Principle of Complementarity, proposed by Bohr, states that in quantum mechanics, mutually exclusive notions such as particles and wave motions are simultaneously complementary to each another and no complete description of one notion is possible without the other. * The Principle of Uncertainty, put forward by Heisenberg, holds that the position of particles and their speed cannot be accurately measured at the same time.